Steerable Pipe Trailers are a Challenger specialty. We offer a wide range of pipe trailers for sale or rent. Our trailers offer excellent performance in mud, dirt, sand, snow and more. Some of our trailers handle up to 90,000 lbs net payload. Whether you are carrying pipe or general cargo, strap winches provide a method to keep your load from shifting. Cross cables allow crab steering on a tight right of way. Our trailers will handle most pipe lengths up to 65 feet. We can help you choose which trailer makes sense for your project while providing stability and balance. Extensions are also available. 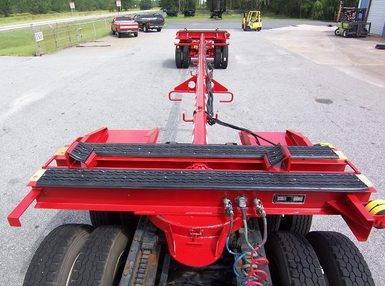 Take a look at our pipe trailers section for our full selection.